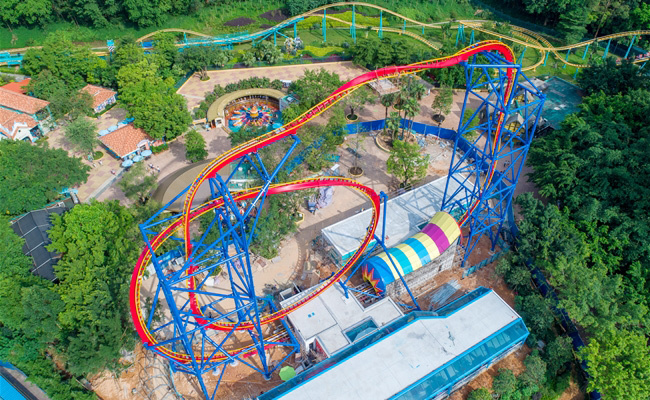 Chimelong Paradise theme park in Guangzhou, China delighted its guests during the National Day holiday with the debut of its high-thrill, high-tech launch coaster- the Sky Rocket Roller Coaster. The multi-launch roller coaster commissioned by parent-company Chimelong Group was designed and manufactured in the United States by Baltimore-based Premier Rides and the ride equipment was exported to China earlier this year. The top-rated park, whose 5A quality ranking from the China National Tourism Administration equals that of The Forbidden City and The Temple of Confucius, is located in the bustling metropolitan city of Guangzhou in southern China. The multi-million dollar triple-launch coaster integrates many exciting and unique elements, including Premier Rides’ advanced magnetic drive technologies and high-quality U.S. fabricated and welded steel. The dramatic layout is the first of its kind in Asia and features one of the highest inversions in Asia. “Sky Rocket brings visitors an unprecedented carnival experience in the “Paradise Town” area of the park on this year’s National Day,” says General Manager Jiang Min Ling. 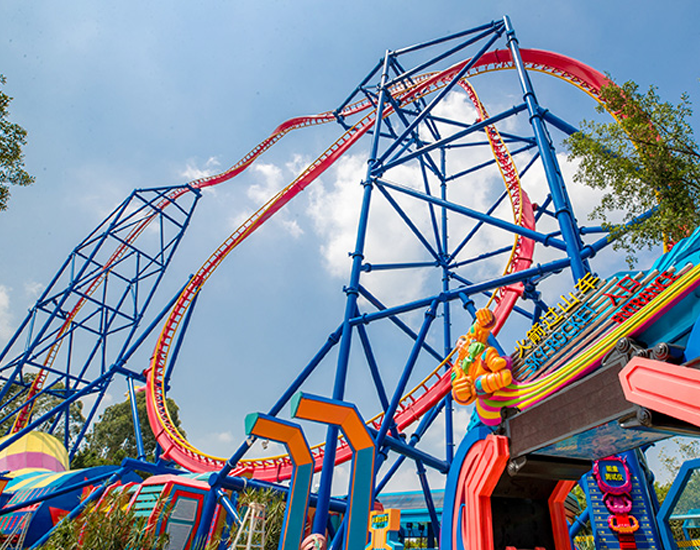 With the launch of Sky Rocket, the growing coaster enthusiast population within China can be pleased to know that a thrilling, crazy, fun coaster experience is waiting for them at Chimelong Paradise. Almost six hundred and ninety million people travel for the celebration of China’s Golden Week holiday, so it was very important and satisfying for Chimelong to have the ride open on time and be available for its large number of holiday visitors. Coaster enthusiasts described the ride as a “ground breaking, free falling” experience. 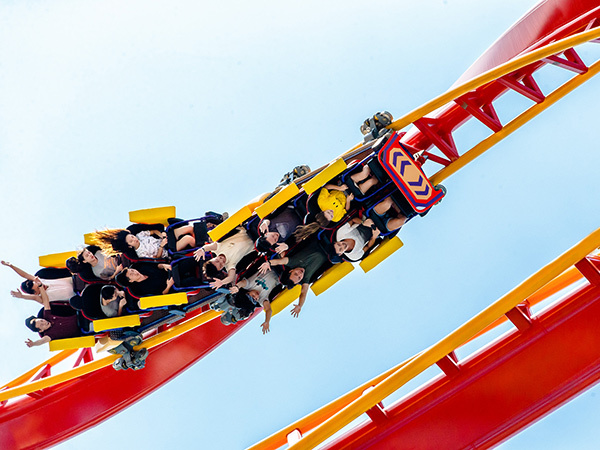 The triple-launch coaster is based on the Premier Rides’ award-winning coasters, SUPERMAN Ultimate Flight located at Six Flags Discovery Kingdom in California and Sky Scream located at Holiday Park in Germany. Sky Rocket has the most current launch system technology available in the industry. With the exception of the coaster train itself, there are virtually no moving parts on the ride which makes the attraction very reliable and maintenance-friendly. Premier Rides is known for focusing on large, technically complex projects that incorporate the newest technologies and has provided the ride equipment for award-winning attractions like The Revenge of the Mummy™ at Universal Studios and the world record-breaking Full Throttle at Six Flags Magic Mountain. The project with Chimelong Paradise raises the bar on expectations throughout the Asian region. At nearly 50 meters high, riders will experience lightning speeds of 100 kilometers per hour, with many exciting and unique elements including multiple launches, a twisting heartline inversion, ascending and descending twists, and two vertical rolls. After an initial slingshot launch using Premier Rides’ signature magnetic launch technology, riders execute a vertical ascent of approximately 20 meters, and then drop back through the station where they are accelerated backwards to a height of 25 meters. After a brief cliffhanger pause, the sleek train rockets through the station and is accelerated this time to a height of 50 meters. The train then slows for dramatic effect where guests can appreciate how high they are while anticipating an amazing twisted heartline roll directly ahead. After executing the roll, the train is braked before guests enter a face-first vertical twisting drop, ending in an over-the-top loop where riders will experience the force of approximately 3 ½ Gs. The riders then drop to ground level, where they again shoot through the station and then smoothly come to a stop as they drop backward into the station.